In the midst of an economic downturn wasn’t the best timing to raise money in Calgary. But, when we started Water for Riley a barrel of oil sold for almost $100 and money flowed with it. Not any more! We are, therefore, so very grateful to receive news today that one of our grant applications has succeeded. It means we are, suddenly, about half way to our fundraising goal. More importantly, it reinforces a specific message: We are trusted to connect Riley Park’s neighbours who had never collaborated before. The Calgary Foundation was the first money in and made us believe we could do this project. Others also see the value of this project to our wellbeing and community spirit. With one of the inspiring student drinking fountain designs in our Riley Park, we will attract visitors and perhaps temporary sculpture gardens as an economic boost to Kensington. Anything feels possible right now as we celebrate the news. We’re very grateful to The Calgary Foundation, the first grantor to believe in our vision, and now to the Community Facilities Enhancement Program for supporting the efforts. The jury will soon select the student design to be built. With this new and significant donation we can ask a fabricator for the cost to build whichever unique design the jury selects from our student drinking fountain designs. Only then will we know how much more money has to be raised. 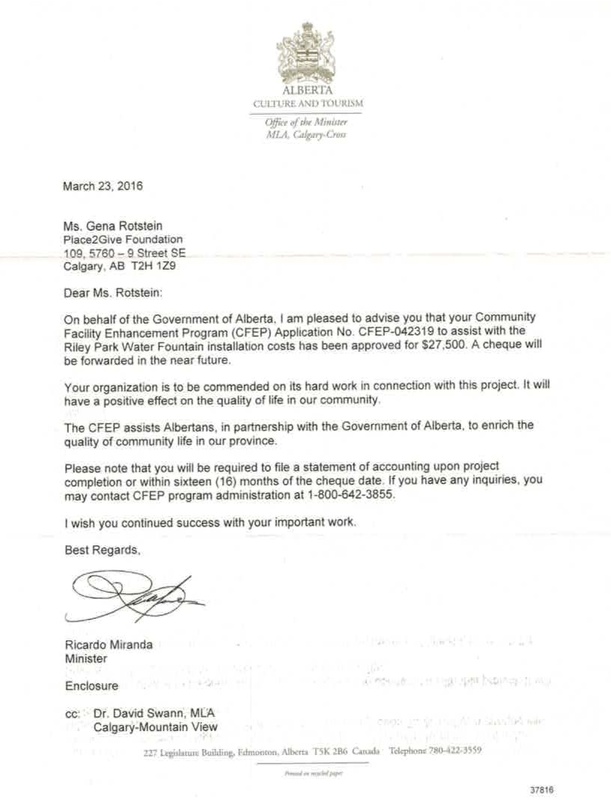 The letter from the Government of Alberta congratulated Water for Riley for … well, here’s the letter with the sentiment, which we appreciate. In conclusion: raise the balance to construct and install the fountain. CELEBRATE (sometime soon) coming to Riley Park, a beautiful functional drinking fountain and an outstanding opening ceremony!! Stay tuned. To participate in Water for Riley, email, or call 403 862 1923. To donate through the Parks Foundation, click in the button and specify your contribution is for the Water for Riley.